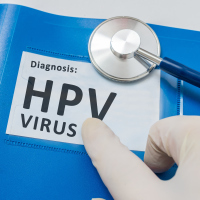 Women who are too old for the human papillomavirus (HPV) vaccine should be the primary focus of cervical cancer screening, a charity has said. According to Jo's Cervical Cancer Trust, while cervical cancer is on the path to eradication for younger women, rates are set to rise for women over the age of 55. A study by the charity has looked at how the incidence of cervical cancer in England may change over the next two decades. Researchers predict that the "peak age" for cervical cancer diagnosis will shift towards women between the ages of 55 and 64 by 2040, increasing by 62%. Meanwhile. HPV vaccinations offered to girls aged 11 to 13 since 2008 will reinforce a 75% decline in diagnoses for young women, says Jo's Cervical Cancer Trust. In a report, researchers say: "Going forward, focus should be placed on scenarios that offer less intensive screening for vaccinated women and more on increasing coverage and incorporation of new technologies to enhance current cervical screening among unvaccinated women." The study has been commissioned by the charity and carried out by published in the Queen Mary University of London. Responding to the outcomes of the research, Robert Music, chief executive of Jo's Cervical Cancer Trust, said: "We are on the path to eradicating cervical cancer among young women, which is extraordinary. "(However,) we are faced with an ageing population and risk among older women rocketing, therefore changes to the programme which could reduce this risk must be explored, including increasing the screening age from 64 and self-testing." Whatever stage your cancer is at, we may still be able to cover you for holidays and overseas travel with our specialist cancer travel insurance.